Tunic is all hand sewn with flat fell seams for strength. This Hooded mantle and robe would suit Druid ritual wear, or a number of LARP characters. The heavy weight cotton robe in a very light brown sports a woven braid down the left hand side. The key hole neck line is finished with two gold coloured buttons featuring a heraldic design which fasten into a hemp cord. 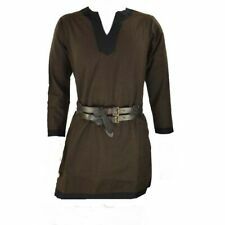 This simple robe would suit a number of Druud or LARP characters. It is finished with a keyhole neck line. I have hand stitched a brown leaf trim to the ends to indicate nature and trees. The key hole heck line is finished with two wooden buttons and hemp cord. The sleeves are set straight into the robe, and open out at the wrist end as shown in the pictures. All internal seams have been over-locked. I have decided to reuse an older style design of robe that I first created last year. Side buckles on the torso ensure the armour can be adjusted to comfortably fit the wearer and aids the process of the leather moulding to your body shape. The dark elf leather armour is best suited for people between 1.70m and 1.95m tall with a chest circumference between 98 cm and 120 cm! 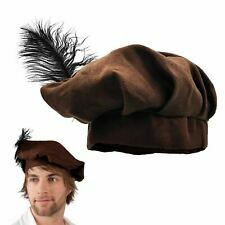 It is made from a lieght weight plain black cotton. All internal seams have been over locked to avoid fraying. Chest Shoulder Length. Cold water wash gentle, drip dry, iron. XXXlarge-68" 27" 37". XXlarge- 64" 26" 37". (Note: We are not responsible for custom duty. ). You can also provide tailor made size also. Gambeson Red batting Medieval-Reenactment-buttons-Aketon archer arming jacket.. There are further pictures of the robe with a black carpet yo show more robe details. This robe is for sale with the gold yellow collar, mantle, capelet. The yold capelet or gorget completes the look. You can also provide tailor made size also. (Note: We are not responsible for custom duty. ).